Tao Shang and Rui Qi Shi have contributed a new project - OpenSocial Gadget for Facebook in EE. They describe the functionality of this gadget in the IBM Connections wiki. 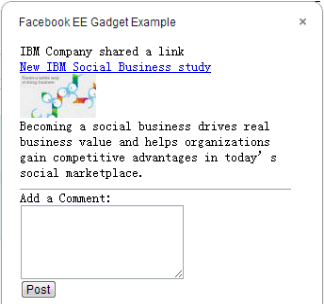 The gadget assumes that Facebook entries have been pushed into the IBM Connections activity stream. When users then click on these entries the Embedded Experience shows more information for the particular entry which is read from Facebook. Technically the sample shows how to use the Facebook REST APIs and OAuth from OpenSocial gadgets using the built in OAuth support from the OpenSocial container via gadgets.io.makeRequest.